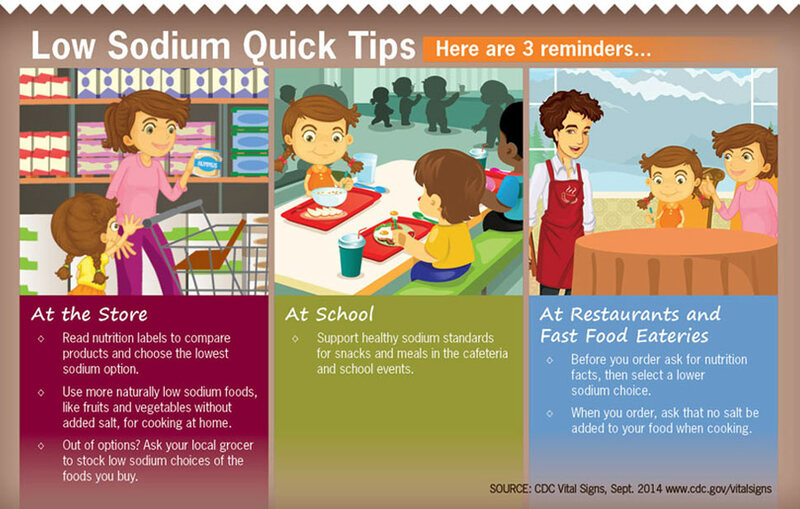 Home » Healthy eating at home, School lunch, Sodium	» Is Your Child Eating Too Much Sodium? Is Your Child Eating Too Much Sodium? With all the recent talk about the dan­gers of a sug­ary diet, many of us moms now pay close atten­tion to our kids’ sugar intake. But what about sodium?!? If your fam­ily eats processed foods or likes to dine out at restau­rants, your chil­dren may be con­sum­ing too much. Since Feb­ru­ary is Amer­i­can Heart Month, it seems like a good time to share these sodium-reducing tips from Jes­sica Sprag­gins, M.P.H., a health com­mu­ni­ca­tions spe­cial­ist in the Divi­sion for Heart Dis­ease and Stroke Pre­ven­tion at the Cen­ters for Dis­ease Con­trol and Pre­ven­tion (CDC). As a mom of three school-aged kids, I’m con­stantly wor­ry­ing about all of the choices I need to make to ensure they are happy and healthy. Most recently, my biggest con­cern has been reduc­ing sodium in my kids’ diet. 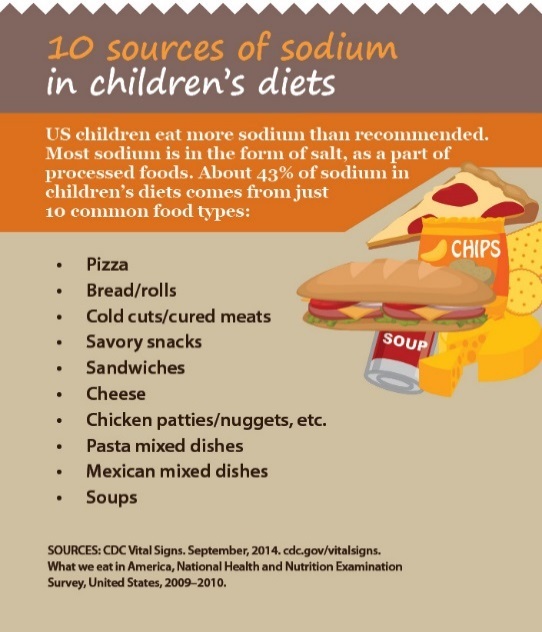 Did you know that 9 out of 10 U.S. chil­dren ages six to 18 years eat too much sodium daily? So if you have 20 kids in a class­room, 18 of those will be eat­ing too much sodium each day. In fact, these kids eat an aver­age of 3,300 mg a day (that’s 1,000 mg more than the rec­om­mended daily amount!). A high sodium diet can lead to high blood pres­sure, which is a major risk fac­tor for heart dis­ease and stroke. You may not real­ize, but most of the sodium in your child’s diet is already in food before you buy it or order it. That’s right, it’s not all from the salt shaker! About 65 per­cent comes from store foods, 13 per­cent from fast food and pizza restau­rant foods, and nine per­cent from school cafe­te­ria foods. While a larger per­cent­age of school cafe­te­rias are low­er­ing sodium in school meals, par­ents can do more to reduce sodium in the food we buy at gro­cery stores and eat in restau­rants. In fact, I didn’t even real­ize it, but some of the most pop­u­lar foods that I buy my kids — includ­ing pizza, bread, cold cuts, sand­wiches, cheese, chicken pat­ties, pasta dishes and soups — make up 43 per­cent of sodium eaten by children. When it comes to snacks, I load up on fruit and veg­eta­bles, which are nat­u­rally low in sodium. To avoid processed food and ensure that I fill my cart with more fresh food, I shop the perime­ter of the gro­cery store (look­ing for low sodium options in the deli) and stay away from the cen­ter aisles. Com­pare sodium lev­els by read­ing the nutri­tion labels to choose the low­est option. When com­par­ing pasta sauces at the gro­cery store, I was sur­prised to see my kids’ favorite pasta sauce had the most amount of sodium out of all the options. I didn’t even know that sodium lev­els could vary so much between sim­i­lar prod­ucts! We’ve now changed to a lower sodium pasta sauce and my kids haven’t com­plained at all. In fact, they like the new brand bet­ter than our pre­vi­ous one! Ask your gro­cery store man­ager to pro­vide more low sodium options of your family’s favorite foods. I’ve asked the man­ager at my go-to gro­cery store to offer more lower sodium options, like bread, deli meat, and cheese—all essen­tial ingre­di­ents in my kids’ sand­wiches for lunch. To increase demand, I’ve asked my friends to join me in this request. Together, we’re mak­ing sure our com­mu­nity has heart healthy food options at the gro­cery store. 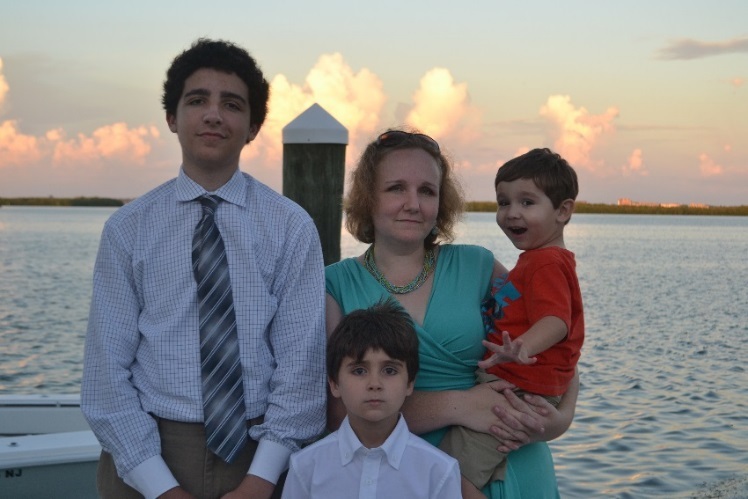 My fam­ily, like many Amer­i­can fam­i­lies eat some of their meals away from home. Some­times there is sim­ply just not enough time to gro­cery shop and prep every meal of the week at home, so some nights we opt for the local fam­ily favorite restau­rant. How­ever, my kids and I always try to stay on mis­sion: to reduce sodium in our diets. We ask our waiter for the nutri­tion facts so that we can choose a lower-sodium option. Regard­less of whether nutri­tion facts are avail­able, we ask that our food be pre­pared with­out salt and choose a fruit or veg­etable as a side. If we’re opt­ing for a sand­wich, we ask for only one piece of bread so that it is open-faced. While we might not always have time to cook, we do have time to choose lower-sodium, heart-healthier options. By low­er­ing sodium in your child’s diet today, you can help pre­vent heart dis­ease tomor­row. By mak­ing small changes to the way you gro­cery shop and eat out, you can make an impact on your child’s daily sodium intake. For more infor­ma­tion about reduc­ing sodium in your family’s diet, visit www.cdc.gov/salt. Jes­sica Sprag­gins, M.P.H. is a health com­mu­ni­ca­tions spe­cial­ist in the Divi­sion for Heart Dis­ease and Stroke Pre­ven­tion at the Cen­ters for Dis­ease Con­trol and Pre­ven­tion (CDC). She sup­ports CDC’s mis­sion to improve the nation’s car­dio­vas­cu­lar health. Jes­sica received a bachelor’s in health sci­ences from The George Wash­ing­ton Uni­ver­sity and a master’s degree in pub­lic health from Yale Uni­ver­sity. She is the proud mom of three boys, ages 15, 7 and 3.